The first New Moon of the New Year. 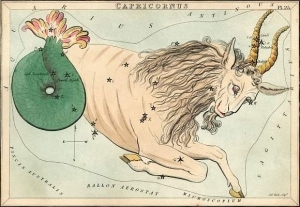 The Sun and Moon meet up in Capricorn, while four other planets are also transiting Capricorn. All this energy collecting in the same sign, along with the fact that all the major planets are motioning direct (not retrograde), bodes well for us. The Sun and Moon are transiting over a critical degree of Capricorn, adding a level of intensity that should garner our attention. This region of the sign offers us more flexibility, even though we may be a bit self-focused on our goals. The new moon is in a stellium with Venus that adds some good opportunities, either with finances or developing relationships. The stellium is sextile to Mars in Scorpio, adding passion and vitality to the mix. We can use this to jump-start a new venture or adventure this week. Additionally, the stellium is square to Uranus in Aries. This has the potential to cause us to feel somewhat unsure or insecure. There is also the increased potential for accidents or some type of calamity to show up around us. Don't over react. Even quick decisions can be measured. We need to create our own sense of stability during this new moon. This Capricorn new moon leads us into a lunar and solar eclipse. The Lunar Eclipse in Leo on January 31 is also a super moon and a blue moon (second full moon in the month). When we have a full moon on the last day of January, we rarely have full moon in the month of February, which is the case this year. We will have a solar eclipse one day after Valentine's Day which will also be the Chinese New Year. We are stepping into some unusual moon events this year. The other planets in Capricorn are Mercury, Saturn and Pluto. Of course, Pluto has been slowly moving through Capricorn for years. We are not likely to feel much different in this regard, except for the fact that Jupiter's sextile to Pluto could add an expansion to the feelings we already had. There could be some good luck with this, but more likely, we will feel as though we have more control over situations. Saturn jumped into Capricorn last month, and Mercury joined on January 11. Mercury is finishing up the conjunction with Saturn, that helped us to be more aware of our surroundings this past week. We are likely to have noticed that we felt more astute than usual. Mercury was out of bounds the beginning of December last year. Because of the retrograde motion in December, Mercury is back into the position of trekking out of bounds again in January for a few days. The OOB transit will be January 17 to January 20. This has that "intensity" factor that causes us to feel unnerved and, if we encounter any disasters, it can cause us to feel traumatized by the events. It is a time to be a little extra prepared to help us to move through the events feeling as though we have some control in the situations. January started with Venus transiting out of bounds, and it finished up its hidek on January 11. Hopefully, we navigated that transit without too much distress. Later today, Venus will move into the Anaretic degree of Capricorn. This can tend to be another intense transit as Venus prepares to push into Aquarius on January 18. With the Sun being close to Venus as this time, there is the added blending of influences between the two planets. We may encounter some interesting events that percolate over into the next few days. Mars in Scorpio is moving out of a conjunction with Jupiter today. We may be a bit too overly confident. Stay grounded in the moment or be willing to step back in order to find perspective. Mars is at home in Scorpio in the classic sense, and Scorpio's trait has a tendency to enjoy the power play of getting a rise and a reaction over some of the most basic interpretations of life. If we are feeling out of control at the moment, it may be Mars taking a jab at our perspective. Overall, this is another strongly collective day with 10 placements in feminine receptives. This can feel awkward to many of us, if we are accustomed to being in control. The team effort wins in making a change for the day. It is simply not a "go it alone" type of day for us. With the majority of the planets in Capricorn, that means that there are six Earth element placements that hopefully helps us to stay in tune with our environment. There are four Water element placements, adding in a day of adapting or, at the very least, treading water for survival purposes. With seven Cardinal quality placements in this chart, we know that we need to be realistic in order to take a stand for our beliefs. On the other hand, we need to be careful not to shut down others in their moment of taking their own stand. We will do a lot better by finding common ground and developing allies. There is room for many stars in the firmament. 1) Goldschneider, G. 1994, The secret language of birthdays, New York, NY; London, Engl. : Victoria, Austr. : Auckland, NZ., Penguin Studio Books.